Salvagnini systems are built using the modularity principle. This guarantees unparalleled flexibility and unlimited possibilities for customized design of integrated and individual solutions for your industry to achieve your exact goals and objectives. Every unit of Salvagnini modular equipment is provided with integrated unique software and can be operated both as a stand-alone machine and as an integral part of an automated manufacturing line or a flexible manufacturing system. A new high-tech solution for sheet metal fabrication production flow optimization, the innovation from Salvagnini goes beyond the classical organization of production and reaches new horizons due to the combination of press brake and panel bending machine that is thoroughly controlled by proprietary CNC software OPS-Flexcell. 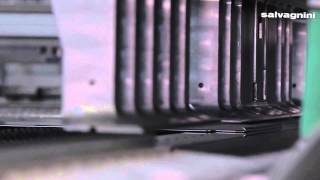 Bending cell is linked up with high-dynamics fiber laser Salvagnini L5. A new high-tech solution for sheet metal fabrication production flow optimization, the innovation from Salvagnini goes beyond the classical organization of production and reaches new horizons due to the combination of press brake and panel bending machine that is thoroughly controlled by proprietary CNC software OPS-Flexcell. 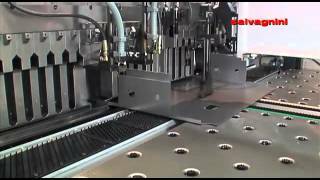 Bending cell is linked up with automated punching&cutting system Salvagnini S4Xe. The modern automated manufacturing solution reaches highest levels of automation. S4Xe + P4Xe is a punching&cutting center that is integrated with an automated panel bender. The manufacturing line can be adjoined by a press brake with robot. For this manufacturing solution, sheets of metal are fed from a tray store while working in automatic mode. This is also possible to store already cut parts aside or place them in a pre-feeding intermediate store next to the bending area. The actual manufacturing of products is carried out fully in automatic mode. This line is virtually a fully automated manufacturing solution. It consists of integrated punching&cutting center, panel bender, and MD tower sheet store. If necessary, the manufacturing line can be linked up with press brake with robot. Thanks to the tower sheet store, it has become possible to feed sheets of different thicknesses and sizes fully automatically at the beginning of the line. This is also possible to store already cut parts aside or place them in a pre-feeding intermediate store next to the bending area. The actual manufacturing of products is carried out fully in automatic mode. Fully automated manufacturing solutions combine punching&cutting center(-s) with automatic panel bender(-s) and automatic MV tray stores. Non-linear systems can be added by high dynamics fiber laser and press brakes if necessary. 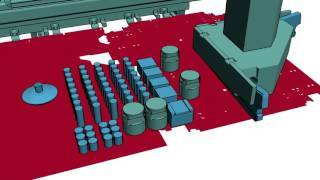 This solution provides programmable automatic logistics of the production flow, feeding of raw materials and sheet metal blanks, and the transfer of cut parts by using automated warehouses as buffer stores and feeders. These are flexible manufacturing units, work of which can be combined linking up various machine tools and organizing automatic sheet metal blank transfer between them depending on the requirements of the manufacturing process. As an industry leader, Salvagnini designs, develops and provides you with what truly are the most advanced technologies for sheet metal fabrication. Most of these technologies are patented by Salvagnini and therefore are not reproducible on the equipment of other manufacturers. The construction of multi-press head punching tool is patented by Salvagnini and consists of a die structure within which up to 96 active tools can be employed working in independent or combined modes. This specific working principle of multi-press head function makes Salvagnini systems unbeatable in terms of both cycle time and tool life. The abovementioned solution is used in S4Xe systems for cutting and punching, SL4 systems for laser cutting and punching, and also in all Salvagnini manufacturing lines that include this equipment. The manipulator is equipped with two pairs of brushless motors (patented by Salvagnini) and moves sliding on firm guides that are integral with the lower part of the C-shaped structure, which provides high positioning precision, shorter cycle times and better dynamics of machining process. The abovementioned solution is used in S4Xe systems for cutting and punching, SL4 systems for laser cutting and punching, and also in all Salvagnini manufacturing lines that include this equipment. The integrated shear is an adjoined part of a single structure, which enables it to cut the uploaded sheet into parts of any size as necessary, without holding scrap from punching/shearing area or from the places where the sheet has been held by the blankholders. Salvagnini Punch&Cut function recognizes the punchings belonging to each individual part and accordingly groups them together and processes them separately. This increases the accuracy and repeatability and also ensures further optimization of the production stream especially for kit production or multiple part production. The patented airplane structure of the load-bearing beam developed by Salvagnini ensures not just extremely rigid construction but also guarantees quick and precise positioning and easy access to the entire work area. Elimination of the optical path helps avoiding many design restrictions and significantly reducing the inertia of the system by making the structure lighter and improving compactness of the kinematic chain. The abovementioned solution is used in L3 and L5 systems for laser cutting, SL4 systems for combined laser cutting and punching, and also in all Salvagnini manufacturing lines that include this equipment. The original patented mechanical solution allows moving the cutting head on the XY plane in the distance of 170 mm while the dynamics is up to 5g with reduced power consumption on account of the light weight. The functional heart of Salvagnini panel bending machine is the unique press that is composed of a solid structure on which the upper blankholder tool is installed; the bending unit, or bladeholder, that has a C-shaped structure, and the counterblade, which works with the blankholder to firmly grip the blank while the blades are bending it. Due to the universal bending unit, Salvagnini panel benders perform the required number of bends, upwards or downwards, in a quick succession and with no time for retooling required. The abovementioned solution is used in P1, P3lean, and P4 panel benders and also in all Salvagnini manufacturing lines that include this equipment. The blank is centered only once at the beginning of the machining cycle. Feeding and the centering cycle take place in masked time, thanks to the flying pincer carriage which, once it has positioned the blank, returns to its rest position while the centering cycle takes place. Since the centering system references the shape of the blank, finished panels are always dimensionally perfect because any deviation from specifications is absorbed by the first bend. Blanks are handled, gripped and rotated by the manipulator, clamp and rotator respectively. 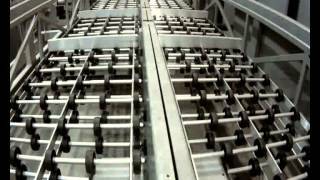 The sheet movement throughout the entire processing cycle is both fast and totally automatic. The continuous rotator guarantees 0.01° angular resolution for higher production flexibility that enables manufacturing of even multi-faceted panels. A machine equipped with MAC 2.0 technology gathers information about the parameters of processed material during the cycle due to smart encoder system that detects the ultimate strength and corrects the bending moves. MAC 2.0 – this is a proprietary technology developed by Salvagnini based on vast experience that company has in the field of sheet metal bending; the technology calculates the elastic return and immediately adjusts the programmable bending parameters, ensuring eliminated waste, high product quality and repeatability of bending operations. Salvagnini manufacturing lines and systems provide an option of integration with the company’s MRP/ERP management software. This allows optimizing the procurement of raw materials and shipment of finished products and introducing the concept of lean manufacturing that operates according to J-I-T system with maximum optimization of time, resources and minimum waste. A unique concept, excellence, full automation and extensive practical experience – all that is used in Salvagnini sheet metal manufacturing lines and systems, which will allow you to create products with perfect quality and repeatability. More than that, the proposed levels of quality and complexity of the product in most cases cannot be accomplished if using equipment made by other manufacturers. We all know how often the staff is causing problems and headaches: the low level of discipline and professionalism, difficult personalities, staff turnover, difficulties when learning and finding motivation or stimuli, unintentionally created faulty products and so forth. Salvagnini completely relieves you of these difficulties because automation allows leveling errors, speeding up production and ensuring the minimization of waste to establish clear and uninterrupted operation and production just in time. Salvagnini solutions are built of the best systems and automated machine tools, start from the simplest to the most powerful and complex systems with 99.99% automation of all processes of manufacturing and logistics. 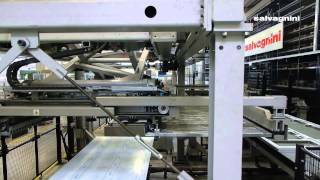 Therefore Salvagnini manufacturing lines are often referred to as “lights-off machines”, which means the machines are working at night-time with lights off. You only need to set up the line, upload the production program, click "Start" button, turn off the lights, close the job shop and go home. Everything else the machines are doing themselves, earning money for you in 24/7 mode. Time is the most important and non-renewable recourse, the force of which makes us highly appreciate it. More than that, time is money – and this thesis is especially important for any metalworking industry. Understanding that perfectly, Salvagnini offers the fastest manufacturing solutions to stay ahead of all competitors and earn significantly more than others. Salvagnini concept of manufacturing provides both all-inclusive integrated solutions and gradual development and improvement of technological chains of the industry. You can expand the production gradually increasing the performance step-by-step in accordance with the level of sales and also planning rationally the cash flow of your enterprise. Understanding the rationality of manufacturing small batches and/or ready-made kit production while maintaining the costs at the level of mass production, Salvanini has implemented this feature, which immediately proved to be popular in the market. This approach to the organization of the production process makes it possible to increase the range of products dramatically, reduce the cost of purchased raw materials, and optimize sales working on J-I-T – “just-in-time" – principle without any loss in speed of the manufacturing cycle. Start from the year 1963, the Salvagnini company is the leading equipment manufacturer in the field of flexible automation due to top level sheet metal fabrication systems that are manufactured and adjusted to the variety of customer requests related to most diverse sectors of application. 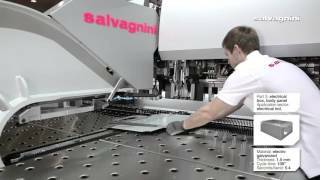 The Salvagnini equipment is widely used by world's leading manufacturers of sheet metal, which has allowed accumulation of vast and extremely valuable experience of dealing with various technological problems that arise in a wide variety of industries. Salvagnini will be happy to share this experience with you and show you how many seemingly complicated problems often have very simple solutions. One of the most interesting and important features of Salvagnini production concept is its nonstop improvement. The company is constantly investing huge resources in scientific research and technology development programs, developing new and improving the existing equipment, improving the CNC software and adding new options and solutions. This is an ongoing work and you will be automatically provided with upgrades of the latest technologies and solutions in the field of manufacturing sheet metal products. Italy is one of the leaders of mechanical engineering in Europe; as a country, it takes the 3-rd place in machine tool building in the world. Many German and Japanese manufacturers are choosing Italian equipment. There are some generally high-level equipment builders in Germany and Japan; however, Italians build stylish machines with exceptional technical characteristics. Let’s look at the example of the car market: Mercedes, BMW, and Audi are simply great and beautiful cars but, if you need some exclusive motor power and quality, the fastest cars in the world have been designed by Italian engineers (Ferrari, Lamborghini, Maserati etc.). Italians are flexible about their work; they are easy to collaborate. Let’s say your plant is situated in some remote location and an equipment problem occurs – there will always be some problems with equipment because there are no ideal machines or manufacturers. Nuances and problematic situations exist; that’s why it matters how we deal with them. Italian production managers do with ease and will always fly to Russia gladly to solve problems, shake hands with their partners, and familiarize themselves with a different culture. Questions are solved quickly and no extra problems arise. Similarly, Italians are loyal to the market of Russia and CIS countries. They understand the importance of good neighbor relations and try to fulfill their obligations in time. Italy is one of the leaders of mechanical engineering in Europe and takes the 3-rd place in machine tool building in the world. Появилась повторяемость при бесконечно больших количествах последовательно обрабатываемых разнообразных заготовок! С помощью оборудования Salvagnini получили то, что не могли получить никаким другим способом: производство дверных полотен без сварки и из одной развертки. Причем гибка 1 двери занимает от 50 до 100 секунд, в зависимости от сложности модели. S4 + P4 manufacturing line at work. Customers always receive fast and individual responses to the questions about the optimal use of Salvagnini machines. Basically, Salvagnini – this is a club, which you enter after the purchase such guaranteeing yourself the ongoing support and care from teams of Salvagnini and Robur International. The customer is never left alone with machine tools and gets the most rapid and constant responses. Of course, keep in mind that nobody will catch the fish for you constantly, but you will be always provided with the best fishing rod! Transportation and installation of equipment: Consultations, transfer, positioning, assembly, commissioning and so on. Maintenance: complex benefits that are aimed at enhanced productivity and reduction of unplanned downtime. Remote diagnostics: Each product line is provided with high precision tools for diagnostics. Software supplies: Development and direct installment of updated programs for better and simpler work. Hardware supplies: Updates for the control units of the machines, upgrades for systems of power supplies and local networks, and other specialized solutions. Spare parts: Every faulty part will be replaced as soon as possible in one of our 29 customer service centers. Tools: Prompt and effective solutions that include professionally and competently selected options. User courses: We offer practical training programs for planning, maintenance and product use to enable you to exploit the full potential of your Salvagnini machine or system. Overhauls and recovery of the equipment. Working with the best equipment and manufacturing quality products at the lowest possible cost will automatically make you the leader of your industry. You will be able to reduce prices drastically at a crucial moment and win. For example, a rival of one of our clients began to copy the construction of their products during the crisis and sold those at slightly lower price. Our customer was able to reduce the cost by 50% for all their product lines while the rival couldn’t afford more than 20% reduction in price. This advantage allowed our client to take over most of the market. Tendencies like this we see in absolutely all customers who have bought the Salvagnini equipment. The reality of the modern market requires that the majority of partners and clients want to get familiar with the production site before deciding on cooperation or placing an order. Having Salvagnini equipment in your production facility will boost the company's image in the eyes of partners, customers and employees, which will bring the company to the next business level and increase the number of major counterparties. The rate of return on the investment is a key factor of business planning as it determines the potential profitability of the project, and also the time when the profit will be received the participants, which is, as a rule, very important. Full automation, unmatched production rate, elimination of waste, J-I-T work of superb quality, minimal costs, and so forth – all these criteria allow us to place the Salvagnini equipment in the category of the fastest payback on your investment. Salvagnini equipment is always in demand. It is extremely rare that a used Salvagnini equipment unit is sold at the second-hand machinery market being younger than 10 years. If this happens, the price goes up to 70% of the cost of a new equipment unit. A renovated 15 years old equipment unit is approximately 40-50% of the price of the new. It is noteworthy that the warranty on renovated Salvagnini equipment is the same as for the new and that is 1 year.